Education: Bachelor of business administration, University of Wisconsin (Madison); J.D., DePaul University. Donald Trump’s election last year promised a Wall Street–friendly change in the national agenda. His cabinet is loaded with former Wall Street executives, and with a Republican Congress backing him up, efforts to scale back securities industry regulations—including the Dodd-Frank Act and the Department of Labor’s fiduciary rule—are underway. “We face an inflection point with a Republican president and a Republican Congress, who are literally looking to gut the protections set up after the worst bear market since the Great Depression,” says Andrew Stoltmann, an attorney who represents investors in lawsuits against banks and brokerages. 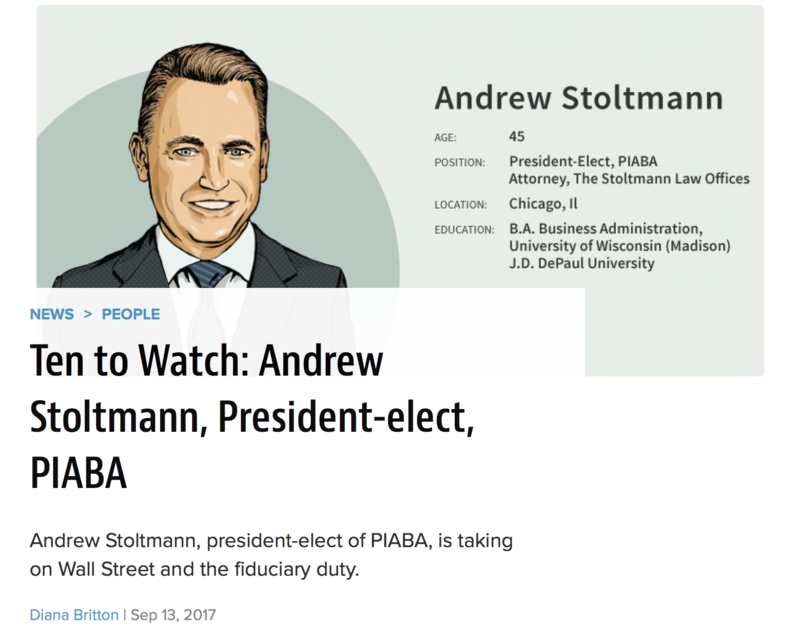 Stoltmann, who is in public anything but shy about his views, will have a larger platform from which to draw attention to these issues as the incoming president of the Public Investors Arbitration Bar Association (PIABA), an international bar association of attorneys whose members represent investors in disputes with the securities industry. He brings a youthful energy to the role and is an active presence on social media, with an ability to make a pointed argument in less than 140 characters. At the top of his agenda? The fiduciary duty. He’s set his sights on the Securities and Exchange Commission, which has raised issues about the DOL’s fiduciary rule and wants to coordinate on a universal fiduciary standard. 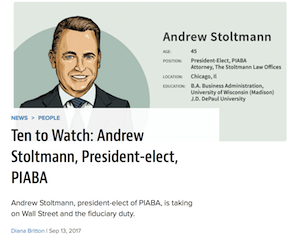 Stoltmann also plans to fight for an unpaid arbitration pot—what he calls “FINRA’s black hole”—to be financed by the authority. A February 2016 PIABA report found that nearly $1 out of every $4 awarded to investors in arbitration goes unpaid, totaling $62.1 million in 2013 alone. A “National Recovery Pool,” financed by the industry, is the best option for recovering those awards, and it would cost less than $100 per registered representative, he says. Broker expungement is another issue. PIABA has urged FINRA to make wholesale changes in its approach to dealing with the way brokers get notices removed from their records. That includes asking for an independent national review of all such requests. “FINRA spends $10 million a year on ads for its BrokerCheck system, but the CRD system is riddled with more holes than a piece of Swiss cheese, and it’s getting worse, because now you have these enterprising defense lawyers soliciting brokers to get stuff expunged from 10, 15, even 20 years ago,” Stoltmann says. He plans to use PIABA resources in a carrot-and-stick approach: The carrot would be working with FINRA to make beneficial changes, and the stick would be exposing FINRA in detailed reports that alert the SEC, which oversees the self-regulatory organization, and Congress to what’s going on.